Shredding leaves is an easy task (much easier than bagging them), and it will provide you with the perfect material to use in your garden. It doesn't require any special equipment, either. Just run your leaves over with the lawn mower a few times to shred them. Then, scoop them up (or dump them out of your lawn mower bag). If you have a lot of leaves to process, consider investing in an electric leaf shredder. It's designed to fit over a trash can, so it collects your shreds as it goes. Mulch: Cover your garden beds with a layer of leaf shreds. They'll help hold in moisture, so you don't have to water as often; and they'll keep the weeds down. Shredded leaves look nice too, so they can even be used as a replacement for bark mulch. Make the switch, and you'll skip the cost and back-breaking labor that's usually associated with laying mulch. Since leaves are light-weight you won't even be sore the next day. Protect Plants: Have delicate perennials or root vegetables that need to be protected from the cold temperatures? Insulate them with a thick (six-inch) layer of shredded leaves. It should keep them warm, until the last frost date has passed. Compost: Leaves are rich in carbon. Work some of your shreds into your compost pile to balance out all the nitrogen-rich greens that you've been adding to your pile throughout the year. Here's a really easy way to build a compost bin. If you're new to composting, be sure to check out this list of things you can and can't compost. Soil Amendment: Mix leaf shreds into the soil in your garden beds to improve soil texture and encourage earth worms and beneficial bacteria to take up residence. Here are more free soil amendments to try in your garden. Leaf Mold: Store bags of shredded leaves in your garden shed, or make a bin in your yard for them. Then, let them sit until they've broken down into leaf mold (it'll take anywhere from one to three years). Keep the shreds moist, but not soaked, to speed up the process. Poke a few holes in your bags to allow for good air flow. Tarp leaf bins to keep them from getting too wet. 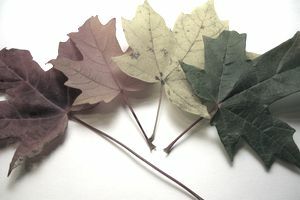 Leaf mold is rich in magnesium, calcium and other minerals, and has a dark brown, crumbly texture that's ideal for supporting plants and beneficial organisms. Still sound like too much work to you? Just mow your yard, with the bag off, to mulch your leaves in place. It'll save you the hassle of raking and bagging, and all of those shredded leaves will improve the soil in your yard, so you end up with a healthier lawn. Another option: rake your leaves into a big pile, make a hole in the center of the pile to catch rainwater, and in a few years you'll magically have leaf mold. Don't shred black walnut leaves. They contain a substance called, juglone, that is toxic to most plants. Also avoid shredding leaves that have come into contact with a chemically treated lawn. Some gardeners like to snag bags of leaves that others have put out on the curb, but that's a risky move because you don't know what types of leaves are in the bags, what they may have sprayed on their lawns or what type of garden pests and diseases they may be battling. If you want more leaves, ask your friends or neighbors to save their leaves for you. That'll give you the chance to ask a few questions. Live in a city that gives away free leaf mold? That may be one freebie to stay clear of. In addition to the chemicals and walnut toxins mentioned earlier, you could inadvertently introduce plant diseases, or poison ivy, sumac or oak oils/plants into your garden. Those aren't freebies you want!